Published on April 3, 2019 in Daily Dirt and National. Closed Tags: Co., concrete, construction, construction industry, contractors, equipment, excavators, heavy equipment, highways, infrastructure, Liebherr, Liebherr Construction Equipment, Liebherr USA, Liebherr USA Co. headquarters, pavement, roads, safety, transportation, trucks. 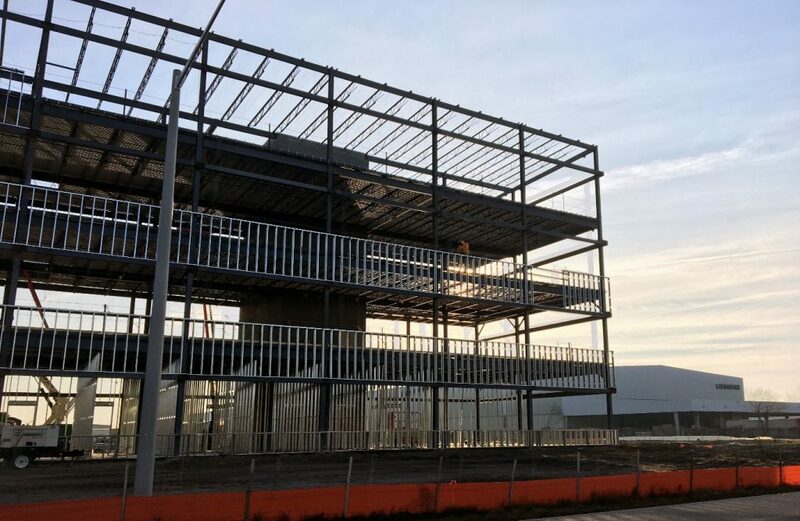 The final piece of structural steel was recently installed at the Liebherr USA, Co. new headquarters building – a significant construction milestone. Work is on schedule for completion in 2020. The project will house Liebherr USA, Co. employees working in administration, finance, marketing, human resources, sales and service, product support, production and distribution for nine product units. The final structural steel was recently placed on Liebherr’s new administration building in Newport News, VA.
Members of the Liebherr family, executive management and Newport News city officials gathered in July 2018 to celebrate the groundbreaking of the $45 million project, which marks a new chapter for Liebherr in the United States. The company has outgrown its existing four-story administration building, which is 100 percent occupied. Favorable weather has allowed construction to proceed without any significant delays, according to safety and facilities manager Terrence Leo. Curtain walls are now being installed on the state-of-the-art four-story administration building. Vertical metal stud framing is underway and the building’s weather barrier is being placed. Next, concrete floor slabs will be poured and windows will be installed. Once the buildings are closed in, work can continue in any weather. A new warehouse and workshop also are part of this expansive project. Concrete aprons on the east and south sides of the warehouse will provide outdoor storage for large components such as counterweights, track chains, and sticks. The south apron will also feature a large canopy for inbound and outbound freight staging. A two-story office and conference room for managers and staff will be located on the warehouse’s south side. Frey said an overview of the entire logistics operation is possible from these offices. Liebherr’s Houston, Texas-based mobile and crawler cranes workshop has also outgrown its capacity. 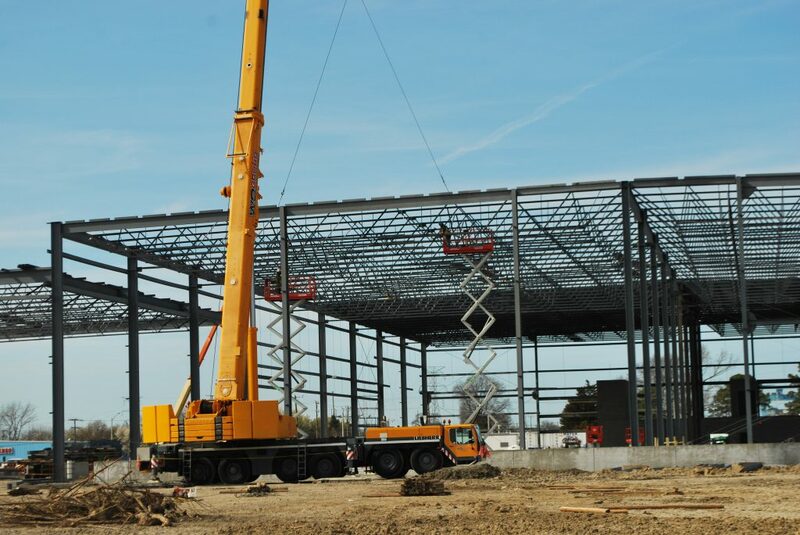 The division is opening a second workshop for cranes and construction equipment in Newport News to accommodate a growing East Coast customer base. The mobile and crawler cranes division will have three stations to service and repair equipment. This will allow the division to improve its efficiency and productivity. Twelve repair stations will be available for the earthmoving division – an increase from the eight currently available – for equipment modifications and pre-delivery inspections. In addition, the building will also house a semi-knockdown kit assembly area for concrete pumps. Warehouse roof installation is underway and foundation work is in progress for the workshop. When completed, the new buildings will add over 251,000 square feet to the company’s existing 560,000 square foot campus. The existing four-story administration building will be retained, renovated and fully occupied by Liebherr Mining Equipment Newport News, Co. Liebherr‘s manufacturing of large mining gauge trucks will continue in Newport News. After nearly 50 years of operation in Newport News, Liebherr is at another positive growth juncture. This investment in administrative, warehouse and workshop facilities greatly expands the company’s operations and demonstrates Liebherr’s long-term commitment to Virginia and the US market. 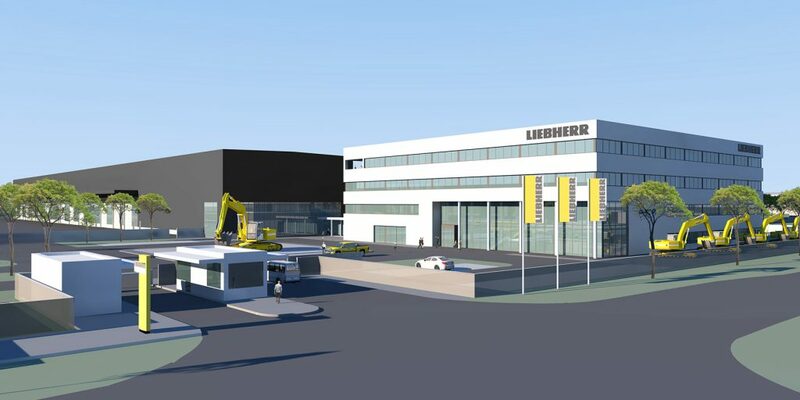 Liebherr USA, Co., based in Newport News, VA, provides sales and service on behalf of nine different Liebherr product units: construction equipment; mining; mobile and crawler cranes; tower cranes; concrete technology; foundation equipment; maritime cranes; components and appliances, which includes refrigerators and freezers. Published on March 15, 2019 in Daily Dirt, Events and National. Closed Tags: AEM, asphalt, bridges, concrete, construction, construction industry, contractors, economy, employment, equipment, excavators, heavy equipment, infrastructure, jobs, pavement, roads, safety, utility. You’ll have the chance to see the latest products from your favorite companies, try the equipment yourself, AND meet the team of technical experts behind it. Applied Machinery Sales Pro-Drill Industries Ltd.
Pi-Lit Witzco Challenger Trailers Inc.
ICUEE attracts the most distinguished construction and utility professionals from around the world to see the latest industry developments and to discover new opportunities for growth. And nearly 18,000 more like this! Published on March 14, 2019 in Daily Dirt and National. Closed Tags: asphalt, bridges, concrete, construction, construction industry, contractors, economy, employment, equipment, Equipment Leasing & Finance Foundation, excavators, heavy equipment, infrastructure, Interstate Highway System, jobs, Monthly Confidence Index for the Equipment Finance Industry, pavement, roads, safety, transportation. The Equipment Leasing & Finance Foundation (the Foundation) releases the March 2019 Monthly Confidence Index for the Equipment Finance Industry (MCI-EFI) today. Designed to collect leadership data, the index reports a qualitative assessment of both the prevailing business conditions and expectations for the future as reported by key executives from the $1 trillion equipment finance sector. Overall, confidence in the equipment finance market increased in March for the second consecutive month to 60.4, up from the February index of 56.7. The overall MCI-EFI is 60.4, an increase from 56.7 in February. • When asked to assess their business conditions over the next four months, 20% of executives responding said they believe business conditions will improve over the next four months, up from 10% in February. 70% of respondents believe business conditions will remain the same over the next four months, a decrease from 83.3% the previous month. 10% believe business conditions will worsen, up from 6.7% who believed so the previous month. • 23.3% of survey respondents believe demand for leases and loans to fund capital expenditures (CapEx) will increase over the next four months, an increase from 13.3% in February. 70% believe demand will “remain the same” during the same four-month time period, a decrease from 83.3% the previous month. 6.7% believe demand will decline, up from 3.3% who believed so in February. • 13.3% of the respondents expect more access to capital to fund equipment acquisitions over the next four months, down from 20.7% in February. 86.7% of executives indicate they expect the “same” access to capital to fund business, an increase from 79.3% last month. None expect “less” access to capital, unchanged from last month. • When asked, 46.7% of the executives report they expect to hire more employees over the next four months, an increase from 26.7% in February. 46.7% expect no change in headcount over the next four months, a decrease from 56.7% last month. 6.7% expect to hire fewer employees, down from 16.7% last month. • 36.7% of the leadership evaluates the current U.S. economy as “excellent,” 63.3% of the leadership evaluates the current U.S. economy as “fair,” and none evaluate it as “poor,” all unchanged for the second consecutive month. • 6.7% of the survey respondents believe that U.S. economic conditions will get “better” over the next six months, down from 13.3% in February. 80% of survey respondents indicate they believe the U.S. economy will “stay the same” over the next six months, an increase from 70% the previous month. 13.3% believe economic conditions in the U.S. will worsen over the next six months, a decrease from 16.7% in February. • In March, 33.3% of respondents indicate they believe their company will increase spending on business development activities during the next six months, an increase from 20% last month. 66.7% believe there will be “no change” in business development spending, a decrease from 80% in February. None believe there will be a decrease in spending, unchanged from last month. Published on March 12, 2019 in Daily Dirt, Industry Activities and National. Closed Tags: AEM, aggregates, asphalt, concrete, CONEXPO-CON-AGG 2020, CONEXPO-CON/AGG, construction, construction industry, contractors, earthmoving, equipment, excavators, heavy equipment, highways, infrastructure, lifting, Mining, pavement, roads, safety, utilities. At CONEXPO-CON/AGG 2020, big iron and tech will share the stage in Las Vegas, USA on March 10-14, 2020, with more new products, thousands of equipment and technology headliners, and hundreds of industry-driven education sessions. Plus, the Tech Experience returns with two locations. Take these 3 steps now to punch your ticket to success for your business and career. Sign up for show alerts to be the first to learn the latest show information – visit http://www.conexpoconagg.com/show-alerts. Be the first in line to purchase show tickets (Registration opens July 23). Register early to save time and money and get the best hotel rates and availability. Stay in the know “365” with the show’s online news and trends articles, monthly CONEXPO Radio podcasts and the new CONEXPO Connect digital platform for contractors and off-road equipment buyers. “Our company has been attending CONEXPO-CON/AGG for three decades now and plans to continue due to the amount of knowledge we gain. CONEXPO-CON/AGG has provided us the resources needed to create greater efficiencies and synergies within our own company,” said Chris Lane of Ronald Lane Inc.
CONEXPO-CON/AGG co-locates with IFPE, the International Fluid Power Exhibition for the fluid power, power transmission, and motion control industries. Association of Equipment Manufacturers (AEM) is a show owner and producer. CONEXPO-CON/AGG & IFPE 2020 will be held at the Las Vegas Convention Center and nearby Festival Grounds. The show connected campus will feature multiple registration areas and hotel and intra-show shuttles. “The show is a critical piece to our workforce development efforts. We send somewhere between 30 and 40 company representatives to Las Vegas to see what’s new and bring relevant information back to our company. It’s a great way to build our team,” said Jarrad Whissell of Whissell Contracting Ltd.
View introductory show video here. Learn more at www.conexpoconagg.com.